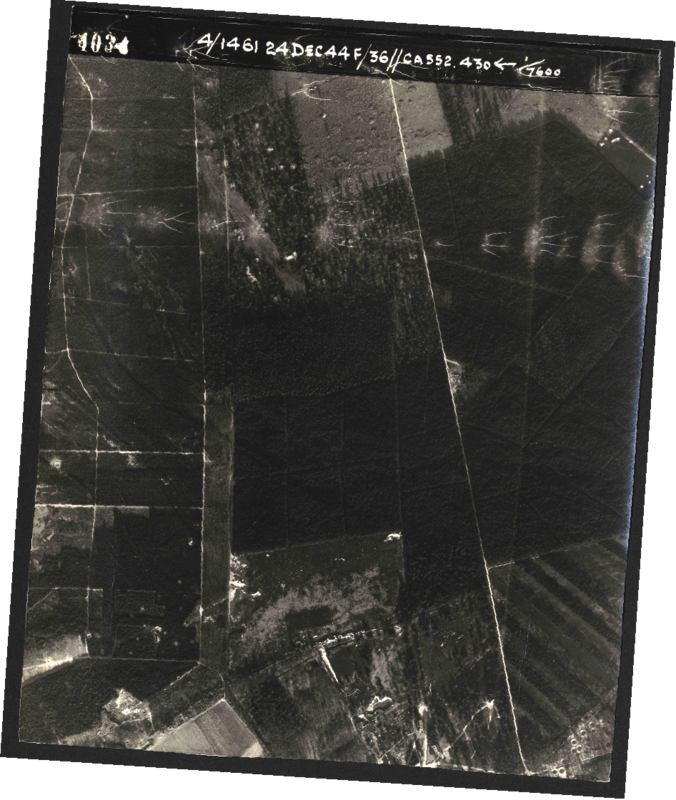 Title: "The Lost Aerial Photos of Arnhem"
Subject: Allied Aerial reconnaissance photographs showing Nazi armored units in the Arnhem area prior to Operation "Market Garden". 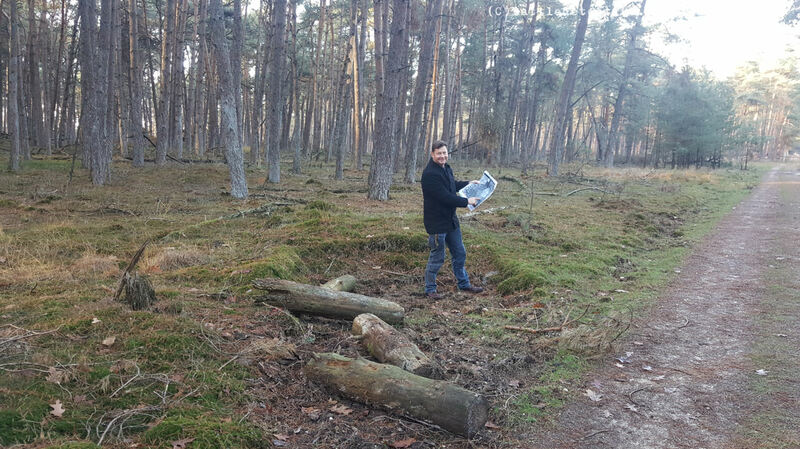 Investigation made at: Deelerwoud Forest, municipality of Ede and Wageningen University, Province of Gelderland, The Netherlands. interpretation, Evidence provided for error in Royal Air Force Air Historic Branch publication. The 1977 Hollywood production A Bridge Too Far features the remarkable story of a British Intelligence officer in the Airborne Corps (named Brian Urquhart in reality but called 揗ajor Fuller� in the film to avoid confusion with Airborne General Roy Urquhart played by actor Sean Connery), who requests a last minute photo reconnaissance sortie and gets the approval for it. The result of the Major抯 determination however, an oblique photo showing German tanks and halftracks concealed in a countryside tree line, is not appreciated by his superior, General Frederick 揃oy� Browning, commanding the 1st Allied Airborne Army. The photo shown in the film (which is clearly fabricated for the production of A Bridge Too Far as it shows the photo which the pilot in a previous scene about the photo reconnaissance sortie took) has intrigued this agency for decades and raised the desire to learn more about it. Several documentaries have shared our interest in photo intelligence indicating enemy armored concentrations in the area of operations of "Market Garden". 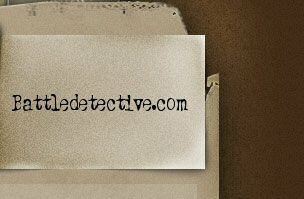 For example: "Battlefield Detectives"; a forensic documentary television series that aired on the History Channel from 2003 to 2006. In Season 2 "World War II: Operation Market Garden" of 12NOV2004 we hear Peter Caddick-Adams of the Royal Military College of Science in the United Kingdom say "In the week prior to the Arnhem operation being launched on the 17th of September, there is a suggestion that German armour is spotted by aerial photography in the Arnhem area". The narrator continues: "But no one since has seen these photographs. Peter believes that if they can be found, and German tanks can clearly be seen, it would be compelling evidence that Operation "Market Garden" was flawed from the outset. The search leads him to the archives at Keele University. But it's frustrating. Although a staggering eight million images survive from the Second World War, at the end of the conflict, the cataloguing system was simply thrown away. Finding images of a particular operation or place is like looking for a needle in a haystack." The documentary then shows an example of an areal photo of Arnhem bridge taken prior to the operation and showing traffic followed by Caddick-Adams talking about details such as tanks and trenches which can be seen in such photographs. Narrator: "It's these traces of German activity that Peter is searching for in the images from Arnhem. [...] But it's the missing images from Arnhem that Peter really needs." In answer to the question of Caddick-Adams if he has found the equivalent for Arnhem, the projector operator in the Keele Archives says: "Unfortunately in the material that we've so far catalogued we have not found anything. it's not to say that we don't have anything but maybe in years to come we will find the photograph that you're after. " But in 2015 it seemed that Dr. Sebastian Ritchie of the Royal Air Force's Historical Branch had at last found the "pi鑓e de r閟istance"
of Allied intelligence for Operation "Market Garden". 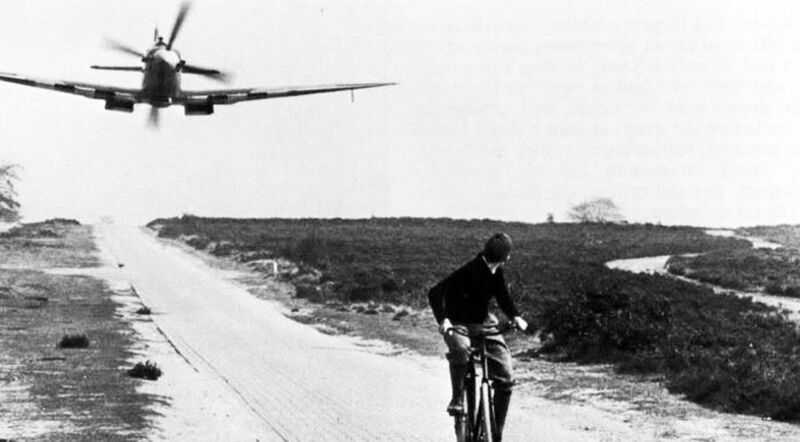 "The Spitfire routed east, north of Arnhem and across the main Arnhem-Apeldoorn road, before banking and commencing a westward run just south of the village of Loenen, orientated slightly north of the Luftwaffe airfield at Deelen. Seconds later, Fuge was flying over woodland known as the Deelerwoud, northeast of the airfield. indicating that it was the subject of a detailed report or briefing. Yet, while the area concerned was immediately next to a very large military target, the lettering clearly did not relate to the airbase in any way, shape or form. Sadly, the report that accompanied frame 4015 could not be traced, but a high-resolution download of the photograph ultimately explained lettering, albeit via enlargement and some digital enhancement. 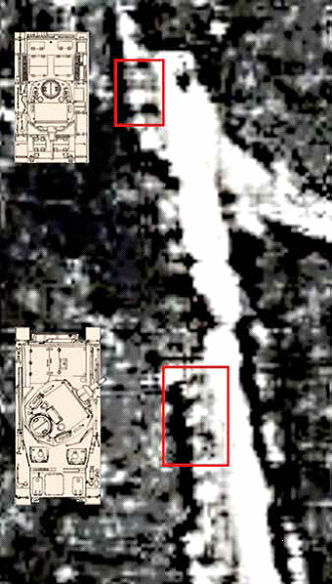 The interpreter抯 task was probably to check each area of the image for indications of enemy activity. In Areas A, B, D, E and F, he had only to confirm its absence: there was nothing to report. The contrast with Area C could hardly have been more pronounced. 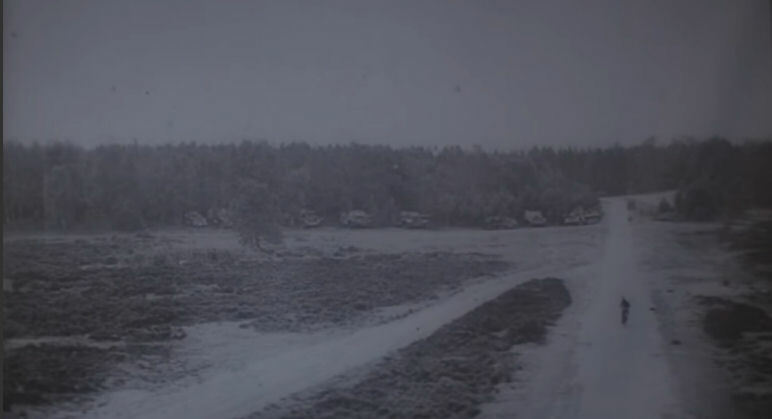 Here, multiple German armoured fighting vehicles (AFVs) and other vehicles can be observed near the intersection of two woodland tracks, apparently halted while moving south. Some are partly obscured by tree cover, while others are in the open; camouflage measures are not in evidence. While there is insufficient resolution and too much cover from trees or shadow to provide more than a few reliable identifications, the larger tanks include Panzer IVs of early design, with short-barrelled 75mm guns; there are also smaller tanks, including Panzer IIIs, which are, again, early models equipped with 37mm guns. Some of the tanks have rotated turrets, probably to create space for maintenance work or fuelling � a routine procedure." Footnote 67 reads as follows: 67. https://originals.dotkadata.com/?language=en#! 1&bron=BWUR_WOII_RAF_USAAF&sortienummer= 106G%2F2816 (accessed on 2 July 2015). 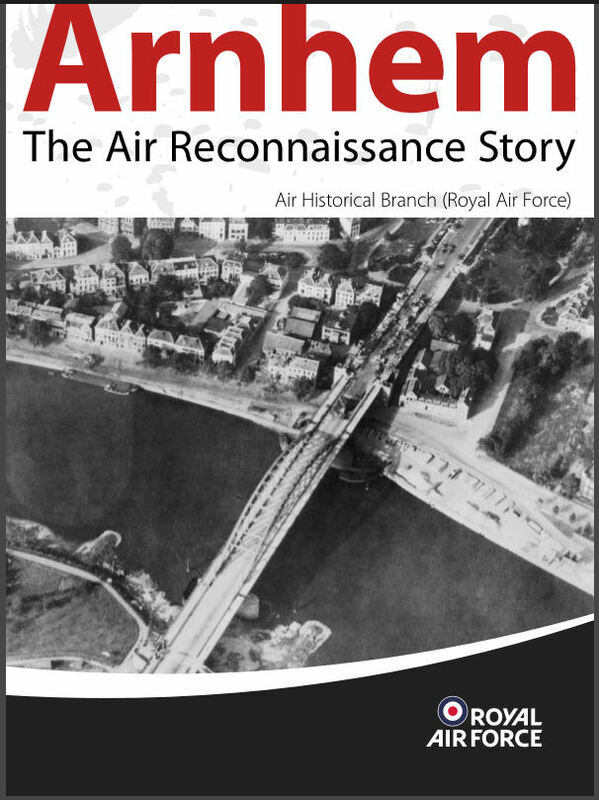 Dr. Ritchie's findings called for further investigation into the case of the 揕ost Aerial Photos of Arnhem". 揚robable supply dumps� and 揟anks, AFVs and other vehicles� on frame 4015. We found these locations by comparing the terrain features in frame 4015 with satellite images on Google Maps and pinpointed the GPS-coordinates. 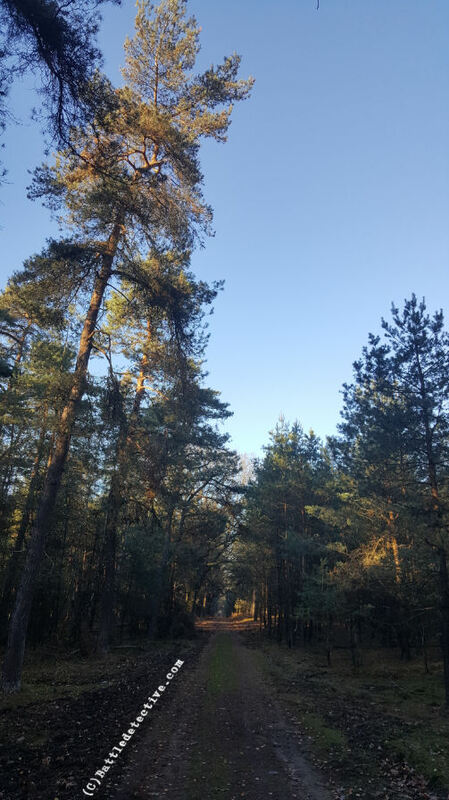 These areas are located along an unpaved track named Hoge Delenseweg in a wooded area named Deelerwoud (Forest of Deelen) which can only be accessed on foot. We found the T-junction with the supposed vehicles and a gate at the end of the track close to where the supply dump would have been. Other than a significant number of large rectangular shaped pits, placed diagonally in the verges of the dirt track, we found no man-made structures in close proximity of the forest path. For some time it was theorized that these holes had been constructed to park AFV's in during bivouac. Fig. 1 The current position of the T-junction in Deelerwoud. 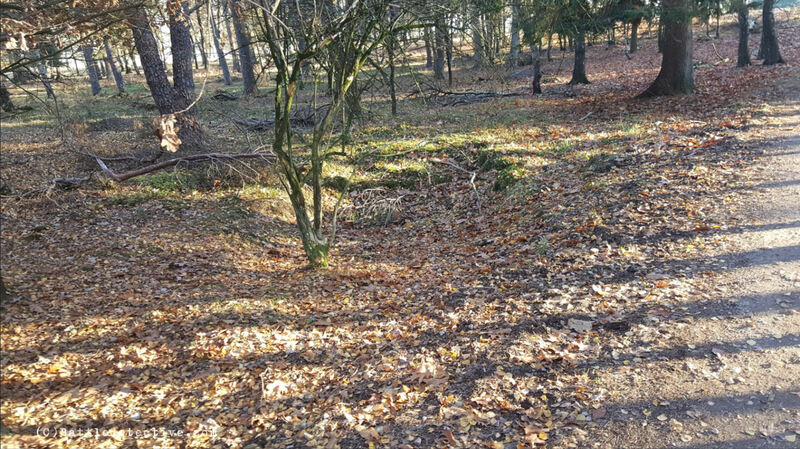 and the airspace above area "C"
An enquiry made via e-mail on 19NOV2018 with the proprietor of the forest, the "Vereniging Natuurmonumenten", revealed that "the way you have described, these are waterholes. These are drainage spots to allow rain water to run from the road top. This has happened often in the past and these are maintained as well." 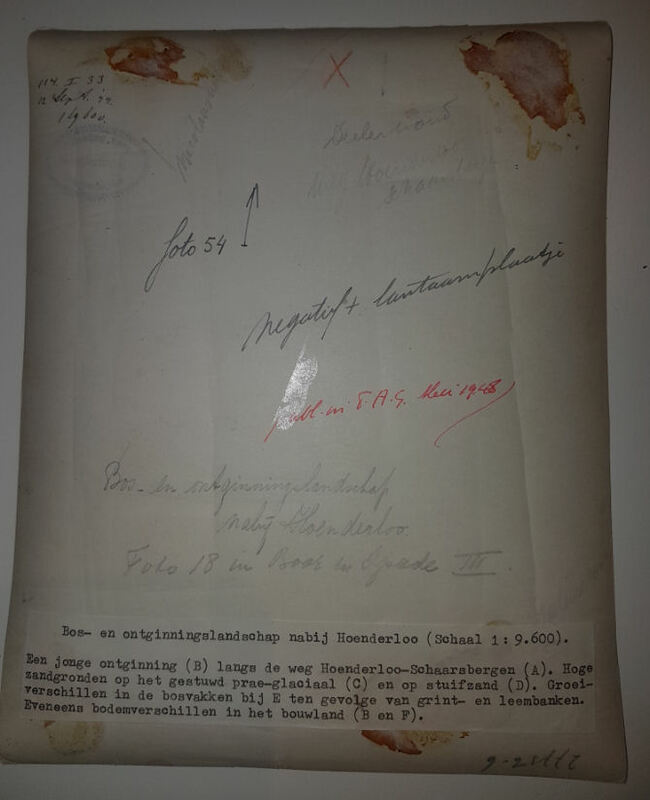 The discoveries of this agency made on Wednesday 21NOV2018 in the Special Collections Library of Wageningen University & Research are amazing and prove Dr. Sebastian Ritchie抯 thesis wrong. Apparently Ritchie has only accessed the photos he used, online and ordered a high-resolution copy of frame 4015 which was the only one with markings on them. 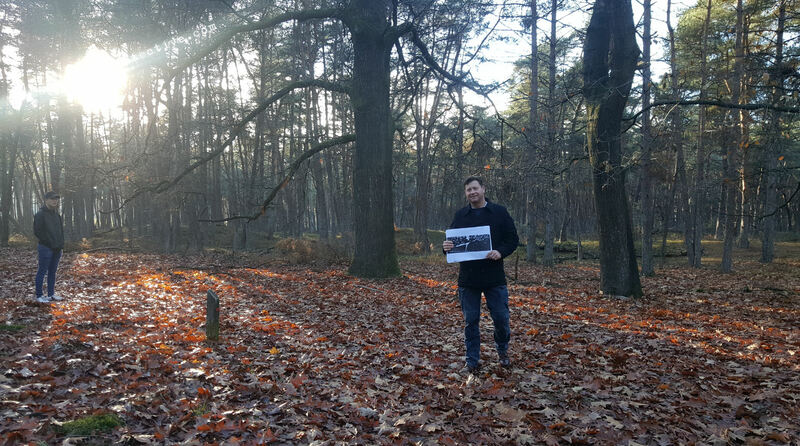 It is our theory that Ritchie has been looking for photographs taken of the area around Arnhem taken during photo reconnaissance missions shortly before Operation Market Garden. He thus found the series taken on 12SEP1944 and zoomed in on the photo with the markings on it. His theory is that the letters A, B, D, and F indicated areas with no enemy activity and C did have enemy activity. Ritchie then sees tanks in such detail that he can make out older Panzer III types and by deduction the Hermann Goering Parachute Panzer Training and replacement Regiment which saw action on 17SEP1944 in Son and later in Nijmegen. was knocked on 17SEP1944 in Son in the book "Operation Market Garden"
However, in the Wageningen University & Research collection of World War 2 Royal Air Force photos we took a look at the backside of the print of frame 4015 and found that these markings were made for the 1949 Dutch publication of the 揃oor & Spade� (Drill and Spade) periodical about soil and ground mapping. 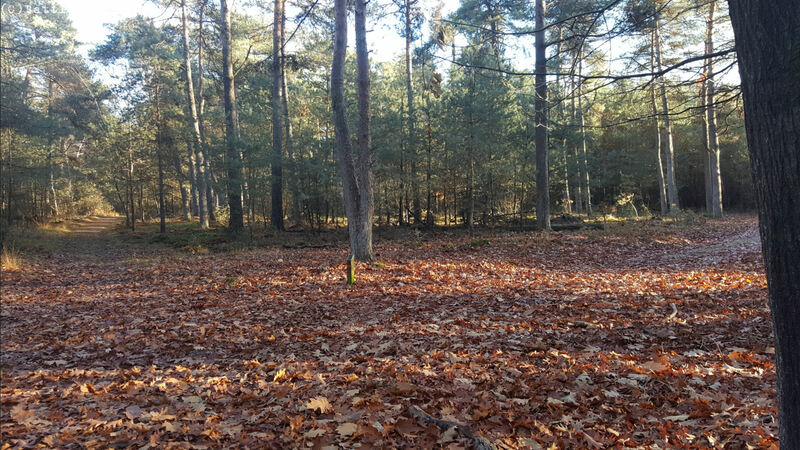 Frame 4015 is used as photo 18 in this issue and shows (as can also be seen in the English summary: "High sandy soils on the Veluwe to the north of Arnhem. A road. F young arable land. C wood. D shifting sand with heath. B and E differences in growth in the wood owing to gravel-pans and loam-pans." The Original Dutch caption for section "C" is "High sandy land on stowed pre-glacial" but not: "enemy activity". 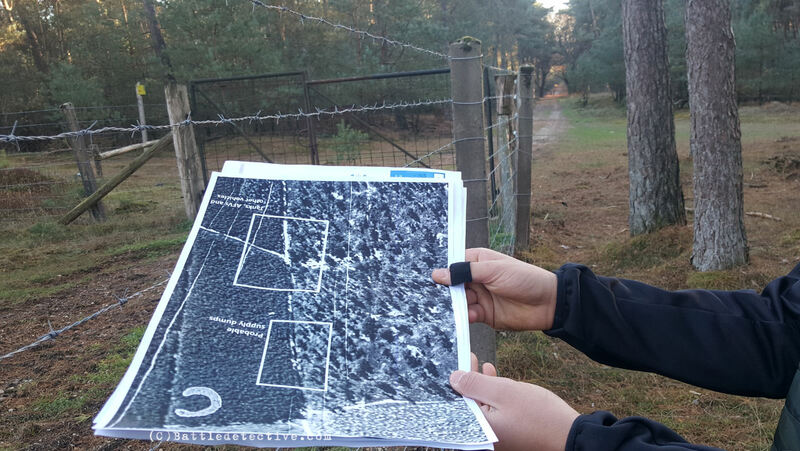 The markings have been added in 1949, not in 1944 and for the purpose of illustrating various types of soil in the Veluwe area in "Boor & Spade". and a strong pocket lamp shining on it, we could create a 3D-image of the area. to tell if we were looking at either wooden crates or vehicles. We did observe, however, that the objects in the photo taken on 12 (and on 19; more later) SEP1944 are not in place at present. 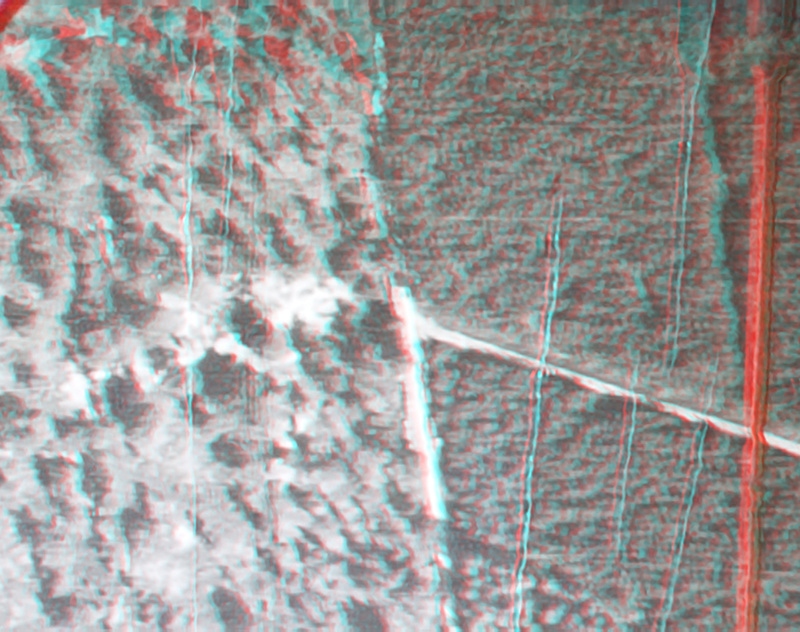 Anaglyph of the T-Junction with objects clearly present. Are we looking at crates, piles of lumber, soft-skinned vehicles or tanks? camera, they were arming, refuelling and moving south in preparation for this deployment. It was probably reasonable to identify the tanks as a potential threat to 1st Airborne Division but the issue was not straightforward. The appearance of modern tanks such as Panthers or Tigers in the imagery would certainly have provided grounds for serious concern, but the prevalence of older model Panzer IIIs and IVs could well have suggested to an experienced intelligence officer that they belonged to a second-line unit of questionable combat capability. 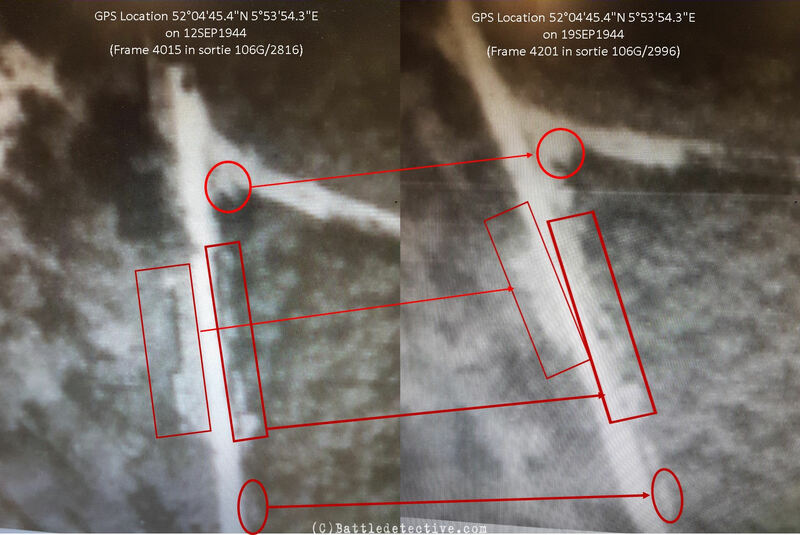 Dr. Ritchie suggests here that the type of AFV can be discerned from the photo and that from it, the unit can be deduced and that these vehicles were moments away from deployment elsewhere. 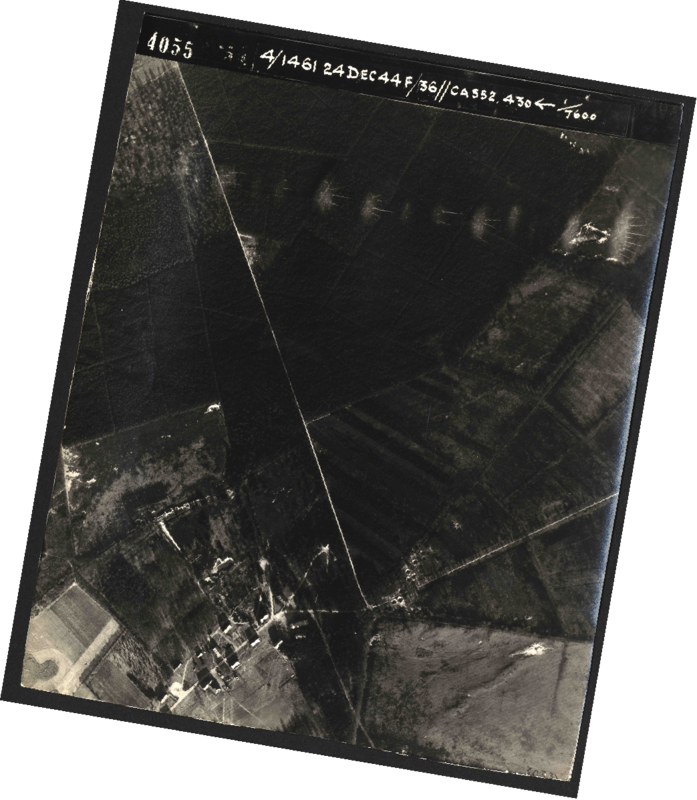 The Wageningen University librarian helped us and found that another photo reconnaissance sortie was flown on 19SEP1944; two days into Operation 揗arket Garden�. 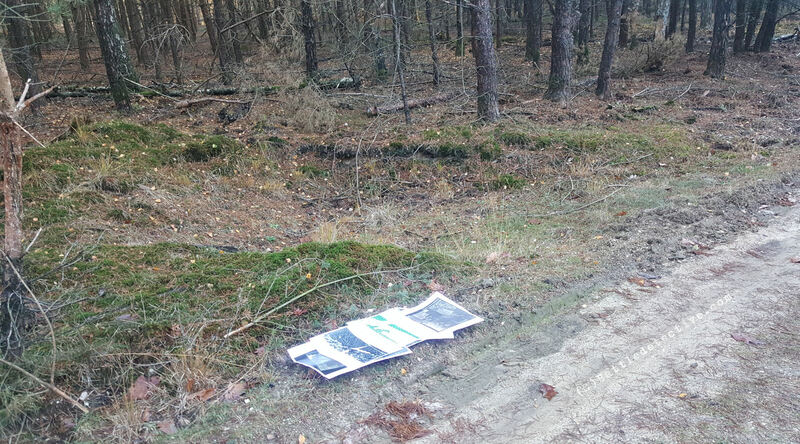 Sadly just the prints of two frames, numbers 4201 and 4202 in the series of this sortie, which show the T-junction in the Deelerwoud Forrest, are missing. on the dirt track, as can be seen on the photos of 12SEP1944. If these were working AFV抯 they would have been deployed. Therefore, if these were the Panzer III抯 of the Parachute Panzer Training and Replacement Regiment Hermann G鰎ing they would not have been at the T-junction on 19SEP1944. scans of the photos on the librarian抯 computer screen and enlarged to the biggest possible size without the pixilation rendering it unsuitable. 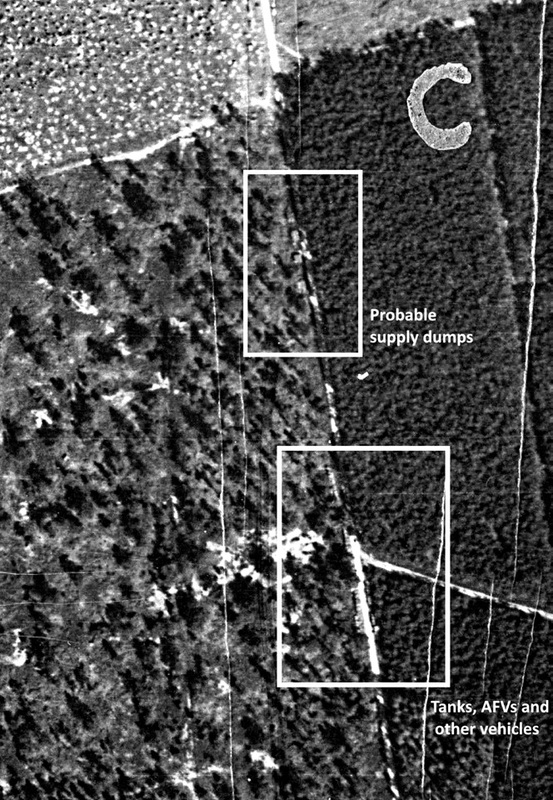 There are also photos taken on the 22FEB1945 and on these, the supply dump objects are now not on the track anymore but next to it in the woods. It seems that the objects next to the T-junction are gone on that day. of the markings on the photo print of which he erroneously assumed that these were made by a photo intelligence analyst. He saw armored fighting vehicles (AFV's) in some shapes on the photo of which he assumed that these AFV's belonged to the Parachute Panzer Training and Replacement Regiment Hermann G鰎ing. 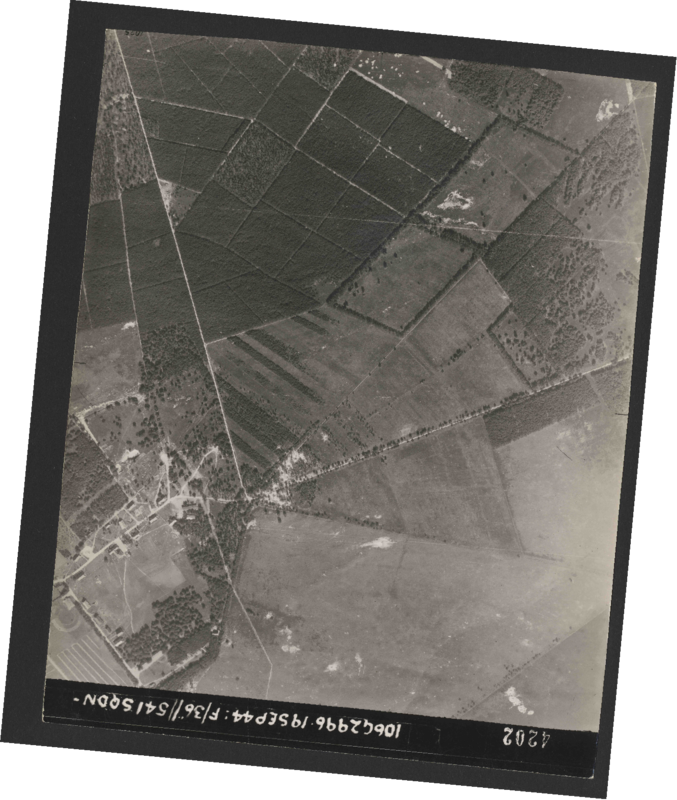 This unit saw action on the 17th but the aerial photos of the 19th show the same objects still in place. It is therefore highly unlikely that photo 4015 shows German armored fighting vehicles which were deployed during Operation Market Garden. 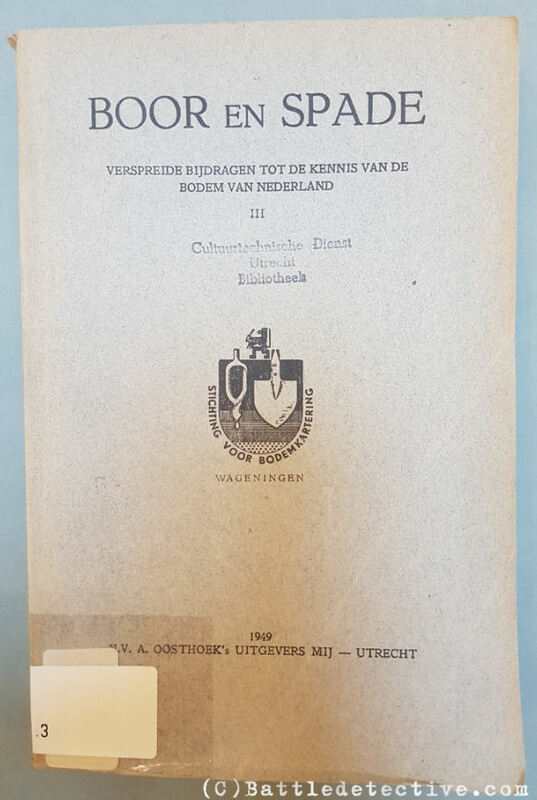 From our findings in Wageningen University and in Deelerwoud we have developed the hypothesis: "Frame 4015 of RAF sortie 106G/2816 of 12SEP1944 and frame 4201 of RAF sortie 106G/2996 of 19SEP1944 both show the same objects on the T-junction in the Deelerwoud and are most likely not German tactical vehicles as theorized by the Royal Air Force Air Historical Branch (RAF AHB)". To validate this hypothesis it is imperative to test its falsifiability. Below are five statements and their argumentations as contrary views on our hypothesis, which are in turn answered by our validating observations. Falsifying statement 1: The book where the lettering was found is not available in the UK. A further difficulty arose because most of the interpretation reports that went with the photographs have been destroyed. The lettering was discussed with several members of the Medmenham Association, which specialises in the history and heritage of air reconnaissance, and they all assumed that it was written on during the analysis/interpretation of the photo in September 1944. 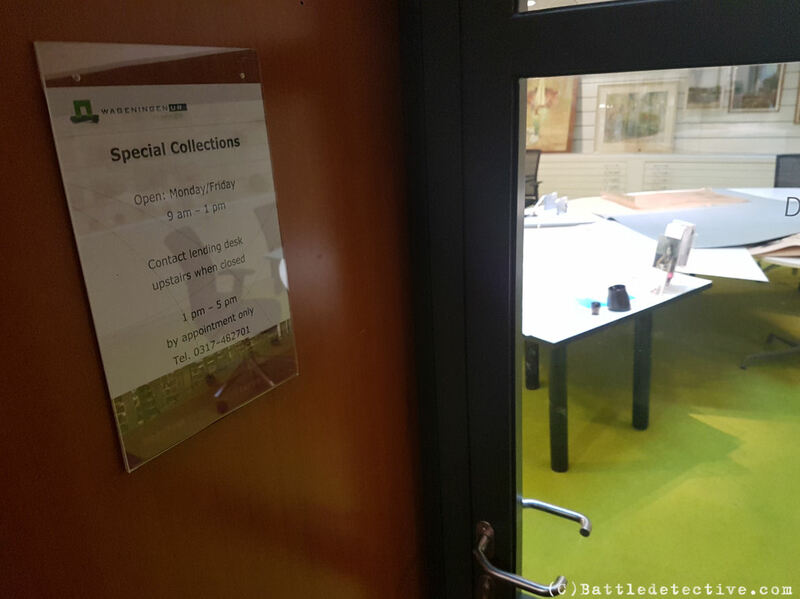 It will obviously be necessary to amend the Arnhem air reconnaissance study to take account of the discovery in the Special Collections at Wageningen University. This statement confirms that an assumption was made about the lettering on the print of frame 4015 which started the focus in this photo and subsequently the rest of the RAF AHB's theory which was solely based on a digital scan. Falsifying statement 2: Frame 4015 of 12SEP1944 wasn't the only instance in which the objects on the T-junction in Deelerwoud were photographed and recognized prior to the operation. An RAF Mosquito also photographed our area of interest on 12 SEP1944. 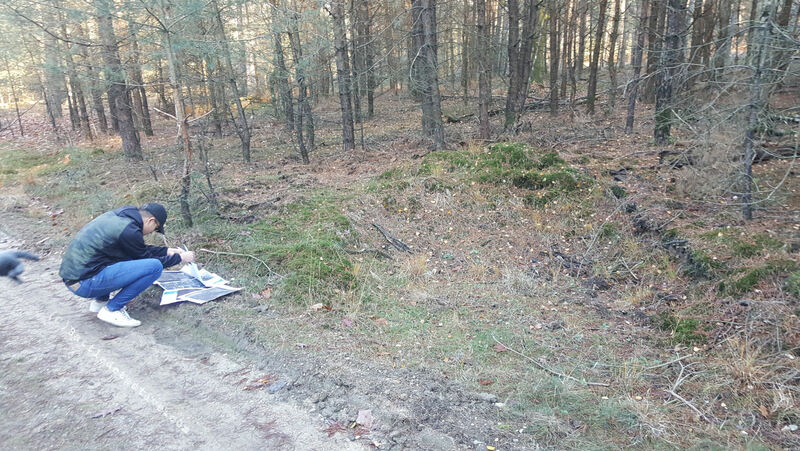 In this instance, the mapping created by the Allied Central Interpretation Unit has survived in the UK, and an 'A' has been marked on frame 4023 at the precise location where the tanks were photographed. This letter would have been matched to another 'A' written onto the photograph itselx`1f (or a blow-up of part of the photograph), and stapled to a single page interpretation report. As an example of this procedure, see the photo of the V2 launcher on page 14. Therefore, we can be 100% certain that this specific place was of significant interest to the Allies. In addition (on page 22), it is recorded in the UK National Archives that a Form White (a fast, high-priority interpretation report) was generated following the Spitfire sortie on 12SEP1944, and that the Deelen area was the subject of this report. On the illustration on page 24 we see a section of map G.S.G.S. 2541 N. of Arnhem (Holland). The map supposedly shows what the cameras in the Mosquito sortie have photographed and on it several rectangles have been drawn. One of these rectangles has the number 4023 written in it and it covers the Deelerwoud. There is no other marking inside this rectangle; let alone a letter 慉�. 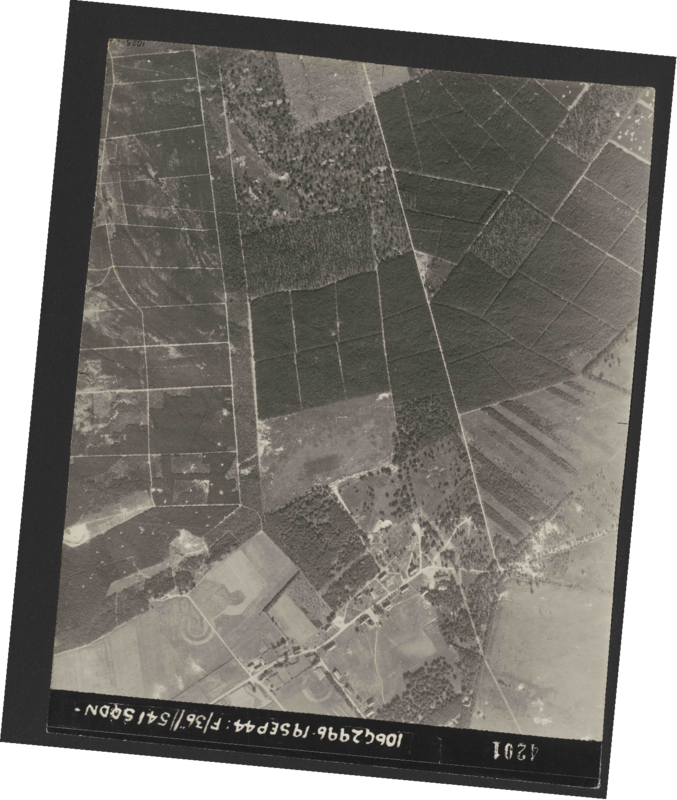 On page 23 we read however: "A plot supplied by the National Collection of Aerial Photographs records the track flown over Deelen by the Mosquito, and shows that its cameras were activated directly over the woods where the German armored unit had previously been spotted. The plotters at the Allied Central Interpretation Unit, RAF Medmenham, had also marked this area with an 慉�/i>". An image of the marking of this area with an 'A' by the Medmenham plotters was NOT provided. This only proves that another sortie was flown over the Deelerwoud on 12SEP1944. It is very likely that this plot and said 'A' marking is not available today. 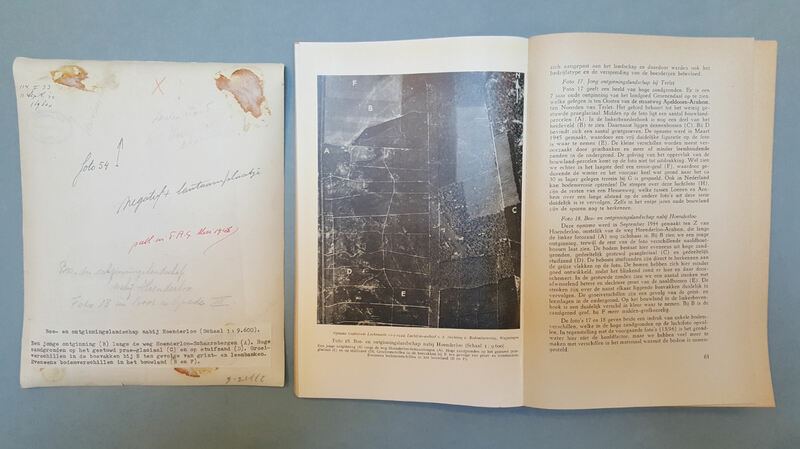 The photograph on page 14 is merely an illustration of what a letter 'A' written on an aerial photograph looks like. 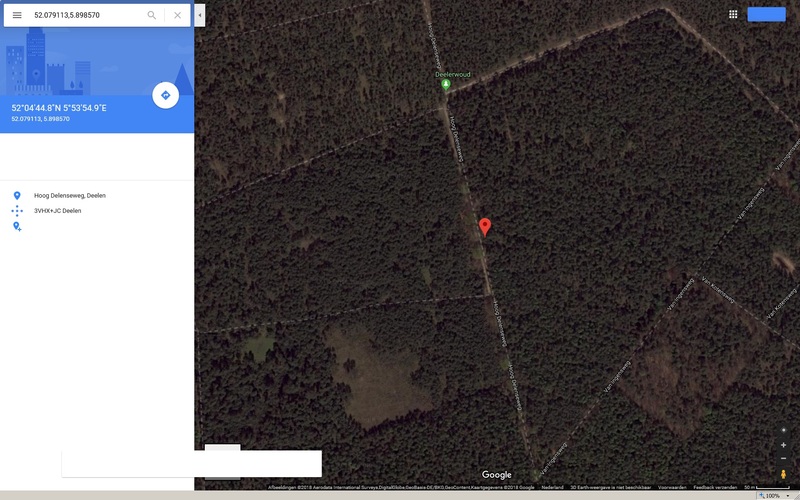 The hypothesis "There is supposedly a letter 'A' on a photo taken in the area of the Deelen Luftwaffe base, hence it must refer to objects on a dirt track north of this base" isn't a logical one. There is no doubt at all that the Deelen area was an area of great interest to the Allies as this was the location of Fliegerhorst Deelen; a large German Luftwaffe air force base which could pose a great threat to Operation "Market Garden" in the form of enemy fighter planes and anti-aircraft artillery. Falsifying statement 3: Two highly qualified RAF intelligence analysts provided their input on the theory about German tanks. Their view was that the 12SEP1944 and the 19SEP1944 photos only appear similar at low resolution. 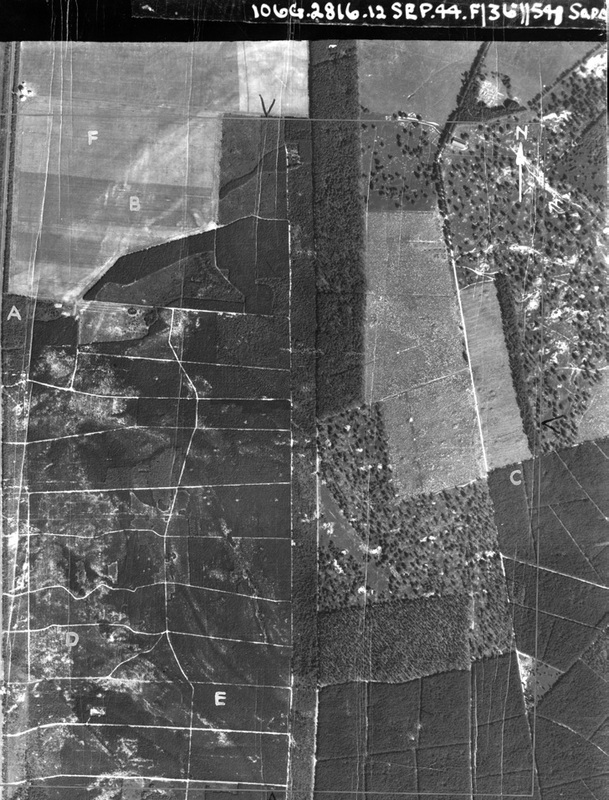 At high resolution, it is clear that the 12SEP1944 photo is far more three-dimensional, showing objects on the ground that project up towards the camera. These are rectangular, suggesting vehicles, and the sun reflection off at least four turrets is the classic indicator of armoured vehicles. They appear as 'pin-heads'. We have looked at both prints of the frames taken of the T-junction in Deelerwoud (frames 4014 and 4015) in person. We used a stereoscope and could not discern detailed features on the square shaped objects sitting along the T-junction; let alone identify Panzer III's, their 75 or 37 mm guns in turrets pointing in various directions, or self-propelled guns and halftracks. Our method was the (3rd) next best thing after (1st) having either irrefutable evidence of presence of these vehicles there and then, or (2nd) access to the negatives of the photographs. 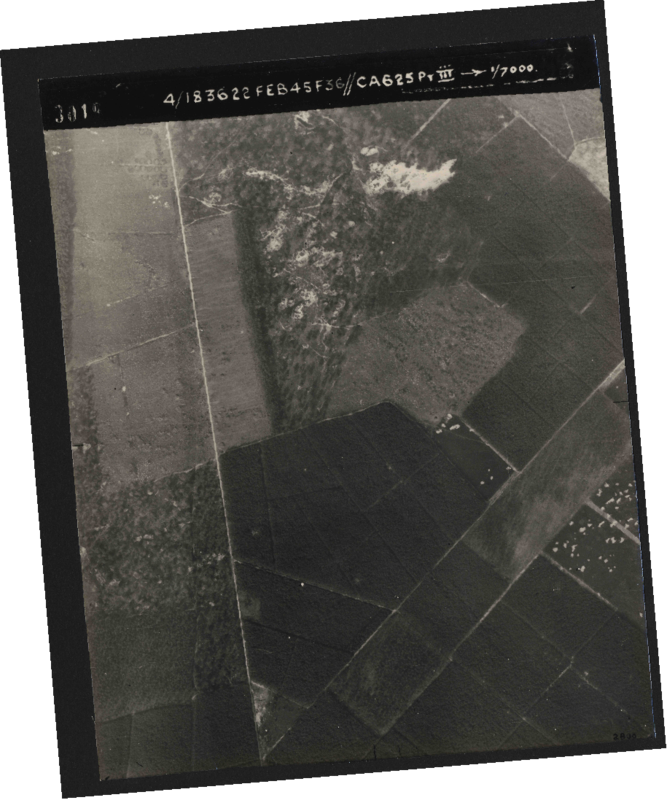 For "Arnhem" the RAF AHB made use of digital scans ordered from the prints kept at Wageningen through the Dotkadata company which is the next (4th) optional method in a descending scale of suitable means of analysis. Ordering of the RAF photos is through this website and it lists the highest resolution as: gem. (average) 9500x11000 pixels. The diagram in Fig. 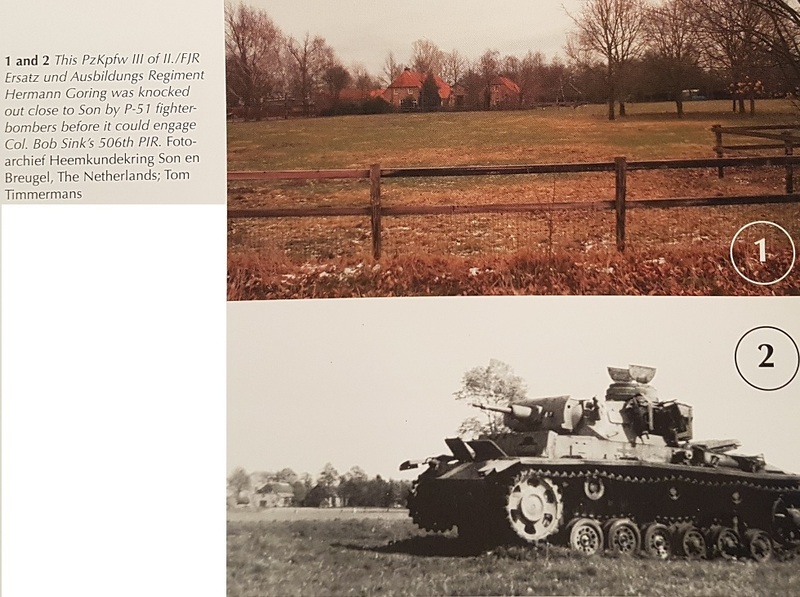 4 shows proof of the presence of a Panzerkampfwagen III in a meadow alongside the road to Arnhem at Wolfswinkel North of Son (first in the scale of evidential value). The AFV sat there from 17 SEP1944 onwards as it was destroyed by Allied fighter planes on that day. 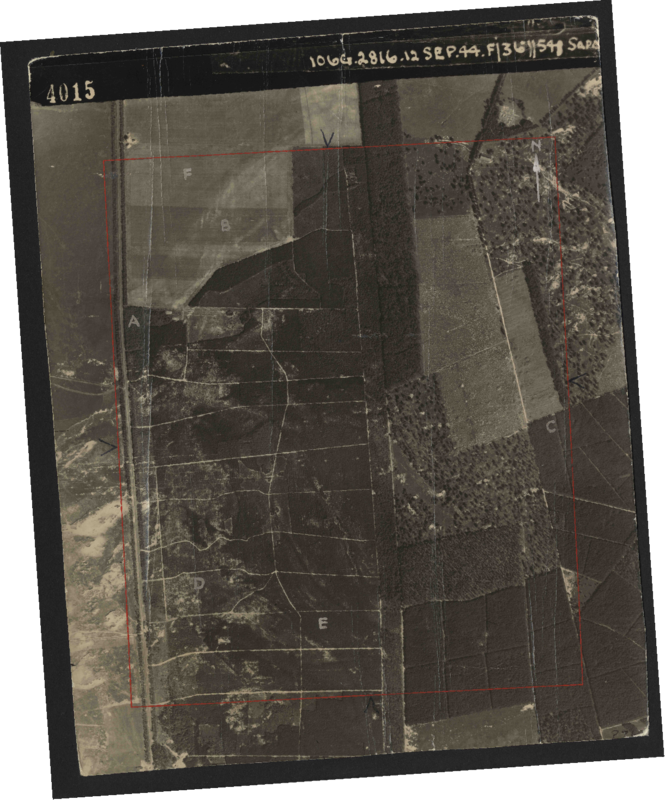 The insets are sections of a digital scan of an aerial reconnaissance photo taken on 19SEP1944 showing the meadow with the AFV in it (fourth on the evidence scale). The vehicle appears as a white rectangle and without the knowledge from the close up we might as well be looking at a discarded refrigerator. Falsifying statement 4: The German vehicles seen on 12SEP1944 are gone in the 19SEP1944 photo. By contrast, the 19SEP1944 photo is one-dimensional: there are no vehicles there. You are looking at the ground. When armoured vehicles � especially tracked vehicles � park anywhere, they scar the ground, turning it into bare earth or mud. The parking areas in this photo had probably been used many times over by vehicles using the supply dumps (which are visible on both dates), so the ground would have been heavily scarred. 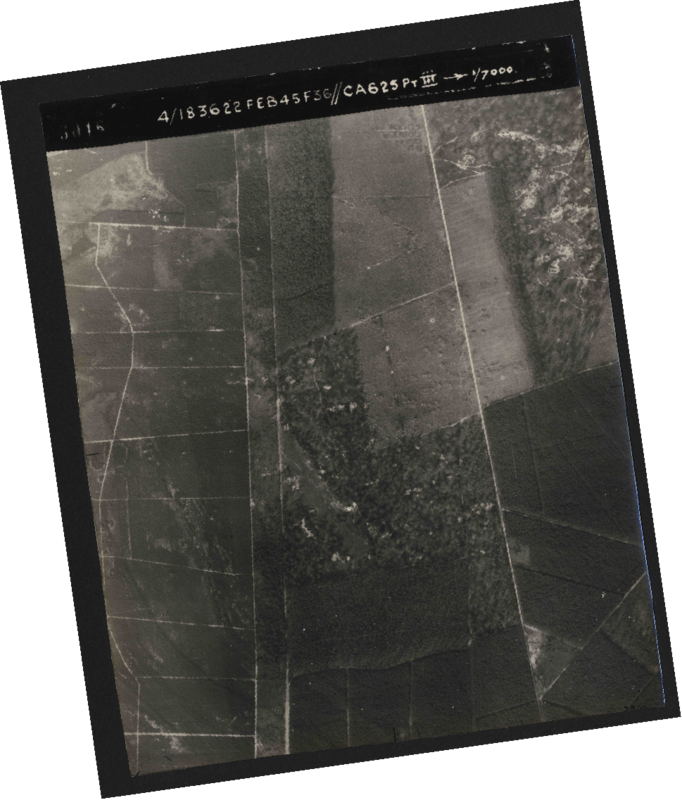 These scarred areas are completely different in appearance from the equivalent � occupied � areas in the 12SEP1944 photo (see for example page 20). Look at the comparison in Fig. 3. The difference between both images is that the 19SEP1944 photo is less focused but not that it would lack a dimension. The falsification theory has it that 19SEP1944 photo shows the traces of (the tracks on) the vehicles shown on the 12SEP1944 photo. It is therefore that we consider it most likely that in both the 12 and 19 SEP1944 photos we are looking at the same objects. 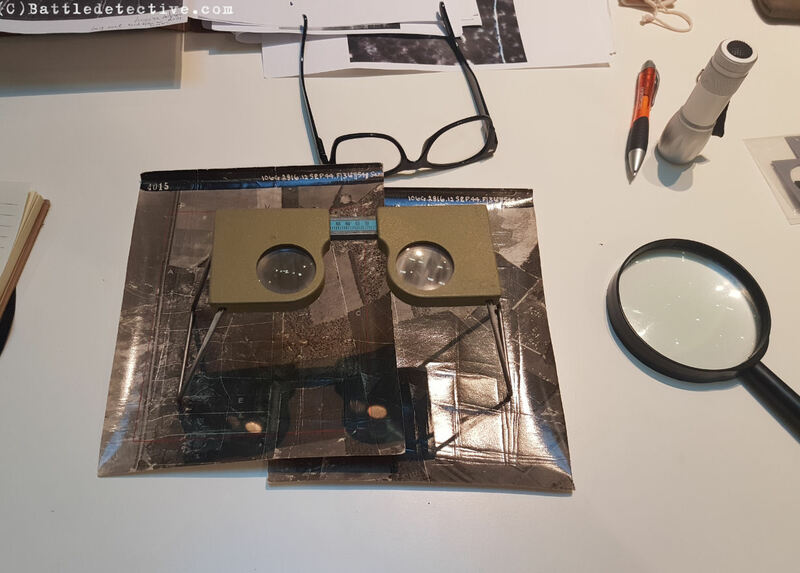 It is a misfortune that the prints of the images taken on 19SEP1944 are missing from the Special Collections in Wageningen University as a stereoscope comparison might reveal more knowledge on what is or isn't to be seen on the images. 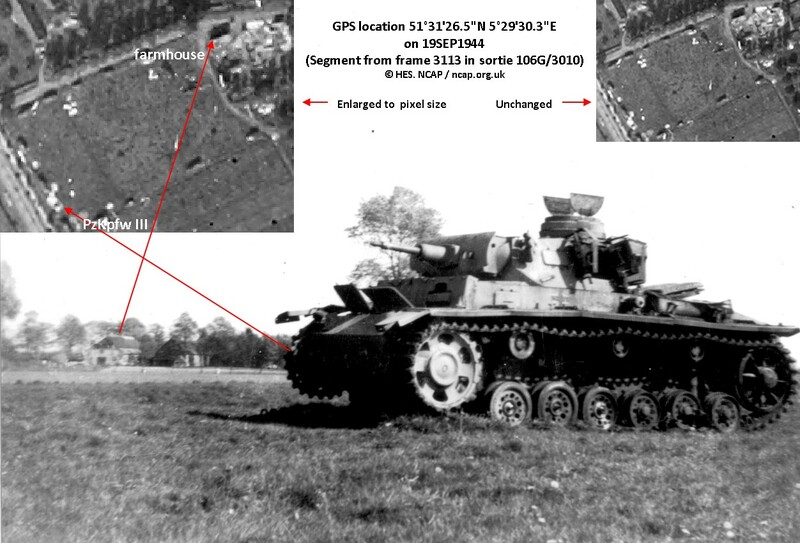 Falsifying statement 5: The enhanced photo of 12SEP1944 shows objects that can be recognized as tanks. In the detailed blow-up on page 38 of the RAF AHB publication, one can clearly see the turrets of both tanks, the frontal armor and cupola of the Panzer IV, and the gun and rear hatch hinges of the Panzer III. The two RAF analysts were 'very happy' with these identifications and with the 'certain� ,'probable' and 憄ossible' labels that were used. One cannot deny that these are tanks of the type identified by Brian Urquhart (and Tony Hibbert); tanks of exactly the type that later showed up at Son. In addition, there is no mention of the fact that the 12 SEP1944 photo shows tactical objects moving along the road, both in the wood and slightly to the north (see page 21). Again, these objects are entirely absent from the 19SEP1944 imagery. When attaching so much value on the input of these analysts it is important to determine when the moment was that they were happy with the labels 慶ertain�, 憄robable� and 憄ossible�. How were they asked to comment on these labels? Was this after the labels had been added to the image or were they asked to look at the junction without any prior knowledge? Here, the digital image has been enlarged beyond the level of the pixels in the resolution as provided (9500x11000 pixels) and the images starts showing horizontal and vertical lines that are newly added by the software. Look for a reference at the tree tops in the forest; the whole image looks as if covered by a checkered layer. The enlargement is too large for this resolution because the image gets distorted/warped/mutilated; in other words altered. It is in this enhancement that the RAF AHB historian recognized 'pinheads' or turrets and gun barrels whereas in fact they saw horizontal and vertical lines that were most likely added by the algorithm of a noise reduction software program which uses an overcomplete DCT dictionary (as opposed to - for example- globally trained dictionaries). This type of software denoises digital images by replacing pixels with filters from its own collection in the way that it is programmed. The image on page 38 is in all probability an enlargement of the scanned aerial photo after this type of denoising because the "grid" on it is consistent with the horizontal and vertical lines in the filters of such a dictionary. In reference to the tactical objects, or more specific the German tanks of the Herman G鰎ing Fallschirmj鋑er Ausbildings- und Ersatz Regiment we note that on page 17, Dr. Ritchie is less sure: on the one hand he claims that they are armored fighting vehicles, on the other he concedes that they are 'impossible to identify'. 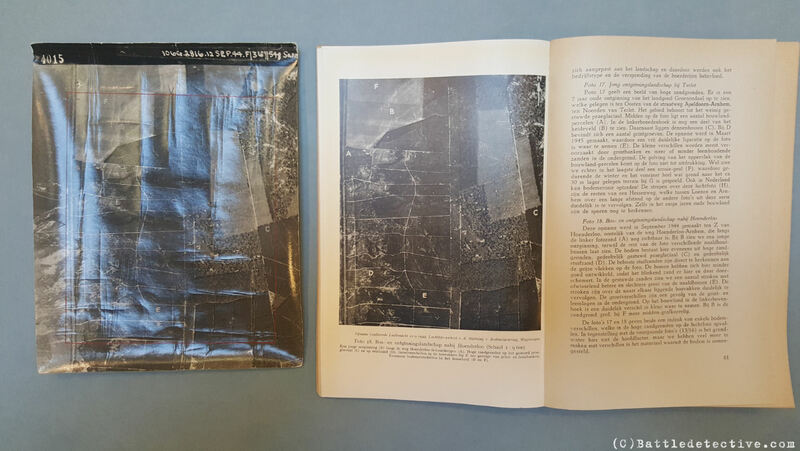 Focusing on these objects (if these are moving can't of course not be discerned in a photograph) is also rather superfluous as it was only because of the 1949 annotations on the print that Dr. Ritchie's interest was drawn to this image. We might as well analyze any other object in the image. The above validation proves that imagery analysis is not an exact science (yet) and is often a matter of interpretation. Any input on our hypothesis is appreciated by this agency. This isn't a review of the RAF AHB publication; Dr. Sebastian Ritchie's work is much appreciated and he has undoubtedly put much time and effort in it and provides insights on aerial photo reconnaissance and image interpretation. 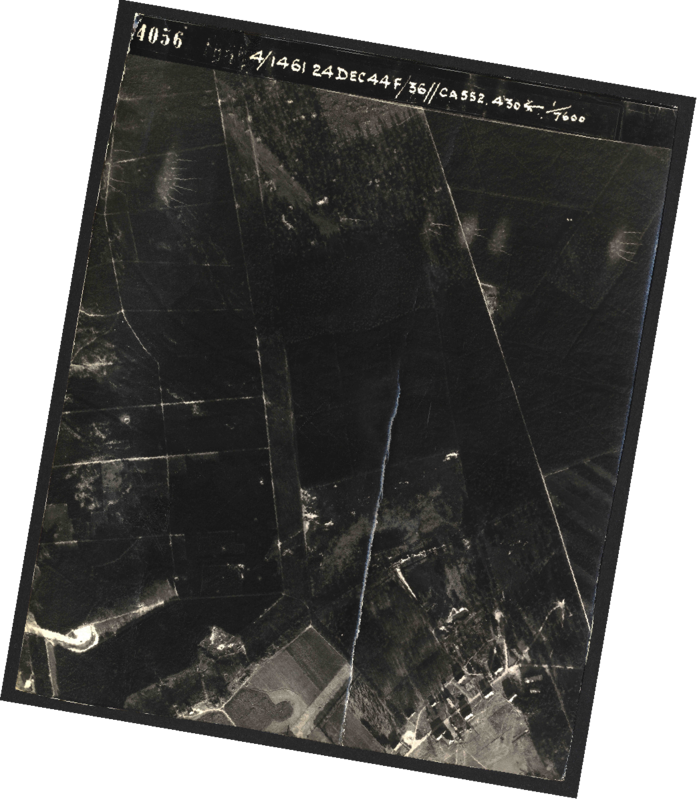 Our investigation only provides the evidence that labeling frames 4014 and 4015 taken on 12 September 1944 as the photos that show German armor near Arnhem prior to Operation "Market Garden" is based on an incorrect assumption upon which subsequently a significant part of the RAF AHB's publication is based. 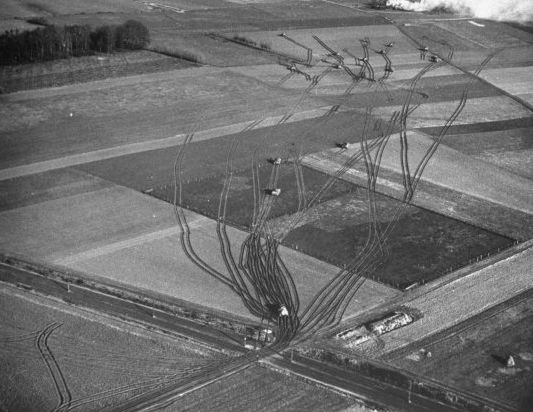 The search for the lost aerial photos of Arnhem is therefore back to the starting point. 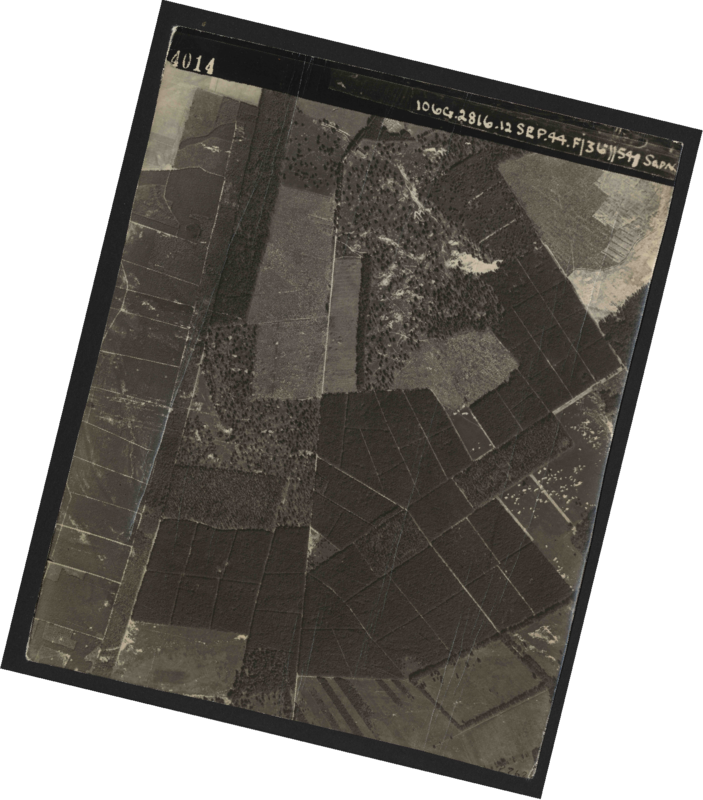 All ten (10) aerial photos in the Royal Air Force collection at Wageningen University & Research showing the T-junction in Deelerwoud Forest, taken in 1944 and 1945.